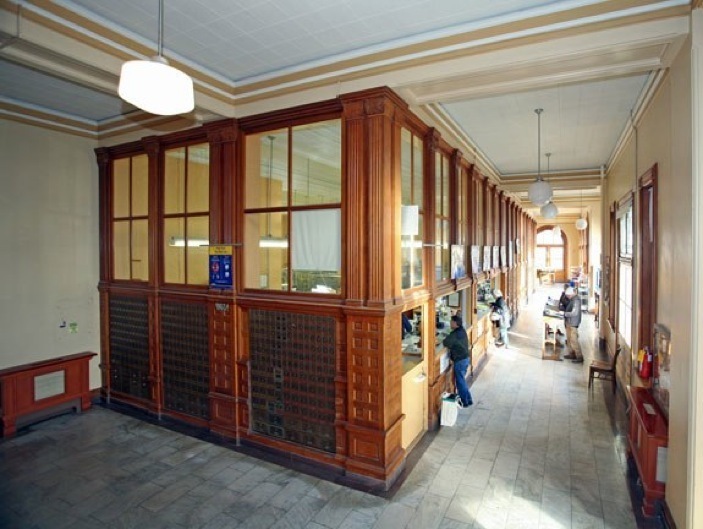 The appearance of the Port Townsend, Wash. Post Office has changed very little since it opened in 1893. While standing in line today, locals still enjoy the unevenly-worn marble floors, carved sandstone exterior and an unobstructed view of Port Townsend Bay. It was constructed as the “Customs House” and intended to monitor shipping traffic. Today, the U.S. Customs Service still maintains an office there even though the ports of Seattle and Tacoma have long since eclipsed Port Townsend. The building has undergone several modifications in its 115 years, but it has never been made accessible to people with disabilities. Both public entrances involve a number of steps, and there is no elevator. Postal officials have tried to accommodate disabled people with a doorbell at the rear loading dock, but that approach creates safety issues and does not comply with the Americans with Disabilities Act and other access requirements, say disabled advocates. A local business operated a contract postal substation with full access for a number of years but ended that arrangement in 2007. That action caught the post office off-guard, and forced disabled people in the town of 8,500 – many of them retirees – to use the post office in the nearest town, 10 miles away. As negotiations with replacement substation applicants dragged on, local disability advocates staged protests to bring attention to the issue. But instead of taking steps to make the National Register building accessible to all, postal officials announced that they’ve been thinking about selling the building and buying or building a new facility for some time. The town’s population is three or four times what it was when the building opened, and the two floors used by the Postal Service are crowded. Without elevators, contract carriers assigned to the basement level take mail from the loading dock on the second level and drive it downhill to the daylight-basement for sorting. That’s one of the reasons that the Postal Service prefers single-level buildings, said a postal service spokesman. The upper two floors are occupied mostly by private office tenants, although the U.S. Customs Office still maintains its offices there. Postal officials from a regional office in Denver visited last year – soon after the disabled access protest – but Swanson described it as a routine visit. The building has been on a list of deficient buildings for some time, Swanson said. The prospect of having to drive out of town doesn’t sit well with locals who are keenly aware of global warming and sustainability issues. “It doesn’t make sense to me,” said Forest Shomer, a 28-year resident. Shomer and other residents said it would be a mistake if they had to drive to a post office that’s always been within walking distance for many. Not only would it increase the post office’s “carbon footprint,” a new building on the edge of town effectively uses residents’ time to subsidize that decision by spending more time driving. 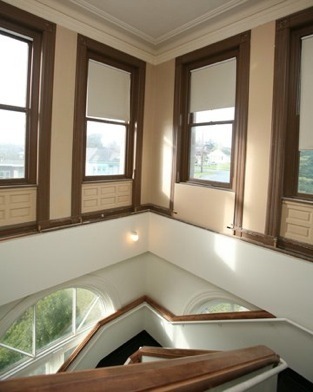 Port Townsend City Manager David Timmons oversaw the renovation of Port Townsend’s 1892 City Hall in 2006. “A can-do attitude at the post office would resolve that pretty quickly,” he said. In August of 2008, the city and the postal service signed a non-binding agreement whereby the city or some other local entity would build a new distribution center for the Postal Service, and it would deed over the Customs House, where retail services would remain. That tentative agreement is subject to more public process and a study. Meanwhile, a new contract station opened in downtown Port Townsend in April 2008. Captain George Vancouver named Port Townsend in honor of British General George Townshend, also known as the Marquis de Townshend, in 1792. The first white settlers built a cabin in what is now downtown in 1853. 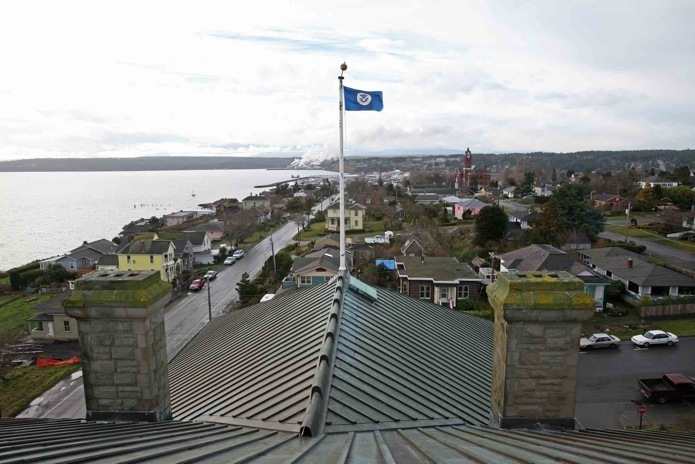 A U.S. Customs office was established in Port Townsend in 1854, when the state’s Port of Entry was moved from Olympia. Later, it was briefly lost to Port Angeles and regained in 1866. Port Townsend held on to the Port of Entry designation until it was awarded to Seattle in 1913. 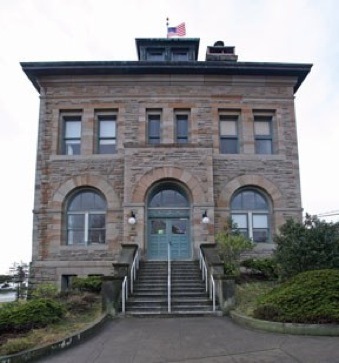 The Port Townsend Post Office was listed on the National Register of Historic Places in 1991. 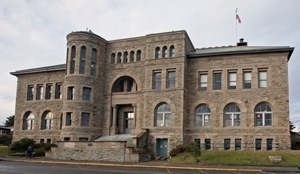 It’s located within Port Townsend’s National Register Historic District, which was listed in 1976. 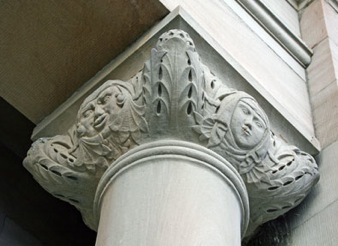 It’s the oldest federally constructed post office in Washington state, and the only example of Richardson Romanesque design in a federal building in Washington. 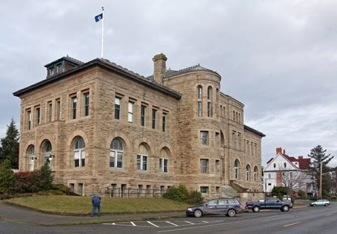 And just as in the days when Port Townsend was known for Shanghaiing sailors and “soiled doves” plied their profession on Water Street, the Customs House remains a prominent landmark as one approaches town by water, perched high on a bluff overlooking Port Townsend Bay. Not long after opening, the south-facing doors of the main entrance were replaced with windows because prevailing winds made the doors too difficult to open. Two less-elaborate side entrances, built per the original plan, provide access to the building. All three entrances have many steps, which have never been supplemented with ramps. Winds also created problems for the original copper roof. In 1916, it was replaced with slate. In 1979, about 300 square-feet of the slate roof was lost in the storm that sank the eastern span of the Hood Canal Floating bridge 26 miles from Port Townsend. A new copper roof was installed for $198,000 in 1979. In addition to replacing the roof, paint was stripped off the redwood paneling to bring the interior closer to its original appearance. 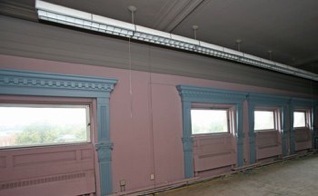 Other modifications include the vertical division of the building’s ornate courtroom during World War II. Walking through the upper space today is like being on a scaffolding, as the tops of windows that once graced 18-foot tall walls are now at eye-level. In recent years, the northwest corners of the first and second levels were gutted to install a second stairwell. That and other alterations were made pursuant to a lease with the Jefferson County Public Works Department, which has since moved out. Although the offices with views are in demand, the other side of the building has a lot of vacant space. The current prospect of selling the property is at least the second one in the building’s 115-year history. In the 1950s, a developer proposed buying the building and moving the post office to a downtown building he owned. That plan was reportedly stopped by Walt Herstrom, the local postmaster at the time. Construction began in 1885 after the land was acquired for $9,000. Originally estimated to cost about $70,000, it took a total of five Congressional appropriations to complete the building in 1893 for $241,822. 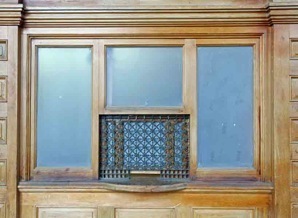 The polished redwood paneling alone cost $34,500. 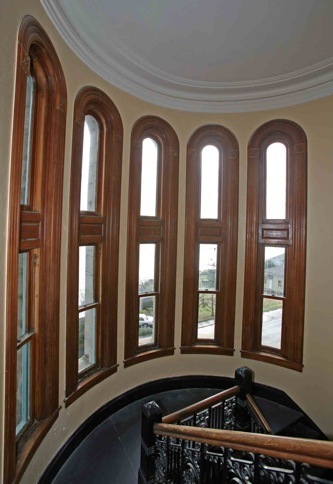 The floors are marble, and the interior stairs have slate steps and wrought iron railings. Even the second floor men’s room has marble floors and louvered wood doors. Clad in sandstone, the walls of the brick and steel building are 28 inches thick at the base. The carved entry columns depict 19th Century S’Klallam Tribe Chief Chetzemoka, his two wives, and his brother. 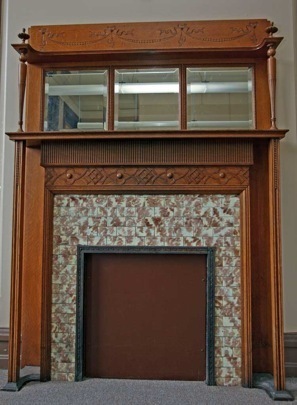 The building was designed and built during the tenures of Mifflin W. Bell and Willoughby J. Edbrooke of the Office of the Supervising Architect, United State Treasury Department. It was originally designed with two tall towers, one round and one square, but they were shortened after Congress declined to fund their full height. One tower would have allowed the U.S. Signal Corps to raise flags and the other would have allowed customs officials to monitor ships. All vessels headed to Seattle and Tacoma must pass through Admiralty Inlet, adjacent to Port Townsend Bay. Benjamin Harrison, elected president in 1888, had friends in Port Townsend and visited there in 1883. He appointed his brother-in-law, John Scott, as superintendent of the project. 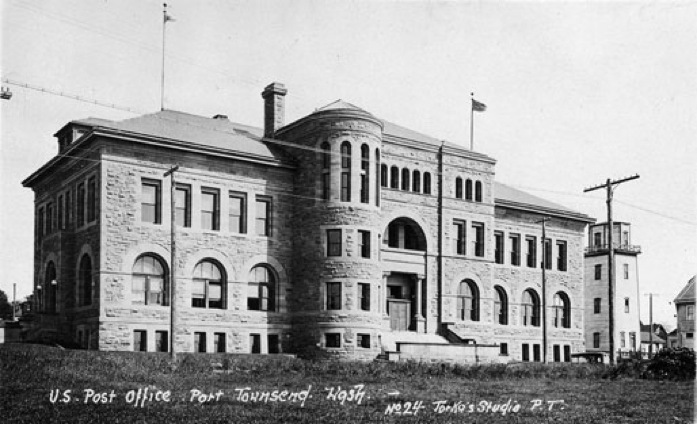 At one point during its construction, the post office was regarded as the most expensive building in Port Townsend. The town’s boom times spawned three electric railways and many elaborate residences and commercial buildings as well as a stately city hall and county courthouse. During the course of construction, however, Port Townsend went from boom to bust when the bank financing a rail line to Portland collapsed. That event and the worldwide economic panic of 1893 caused the town’s population to drop from about 7,000 to less than 2,000 by the time the post office opened, estimates indicate. 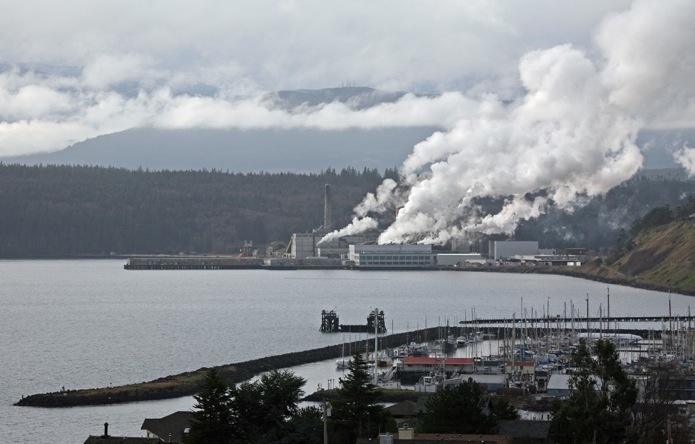 Today, Port Townsend has nearly 9,000 residents. Meanwhile, the populations of Seattle and Tacoma continued to grow, particularly as sail power gave way to steam power, which put Port Townsend at a disadvantage. One could argue that the Customs House was obsolete, or at least over-built, by the time it was finished. 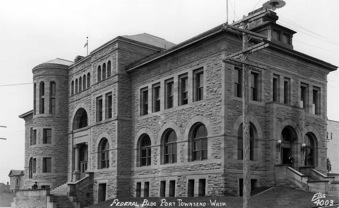 The Feb. 21, 1893, headline of the Port Townsend Leader read, "Port Townsend has the handsomest and most costly post office on the Pacific Coast."